They (the people who know these things) have known about Trevor Lawrence for a long, long time. While the Tennessee-born Lawrence was smashing all of Georgia’s state high school records, he was ranked as the No. 1 overall prospect by every recruiting site and service—every single one of them. It was no surprise to folks at Clemson when he wrested away the starting job in week five, and only small surprise that he became the first true freshman in 33 years to lead a team to a national championship. Now everyone knows. Lawrence was unstoppable, throwing for 347 yards and three touchdowns in Clemson’s 44-16 pummeling of previously undefeated Alabama. It was a dominant performance against a top-level defense that was expecting him to air it out and still couldn’t do anything about it, a professional performance in every sense of the word except the literal. Lawrence is still just 19 years old, so he’s going to get better. But he’s good enough now to make a living throwing a football. Take his final touchdown pass of the game, a third-and-goal where his pass protection broke down and he was eyeing what was effectively triple coverage. This is grown-man quarterbacking, from the unbelievable arm strength to hurl that dart despite a throwing motion necessarily deformed by a pass rusher in his face, to the recognition to identify the narrow window over the outstretched hands of both a linebacker and a d-back but still low enough for Tee Higgins to go up and get, to the decision-making to attempt a tough throw knowing that if it went wrong it still couldn’t be picked, to the execution of putting the ball exactly where he wanted, where a receiver and no one else could bring it in. Aaron Rodgers couldn’t have done it better. 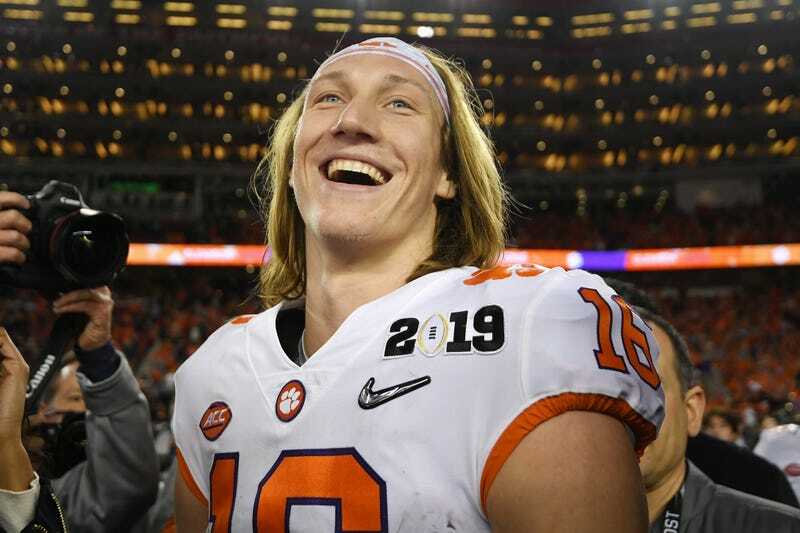 I don’t know if Trevor Lawrence could succeed in the NFL next year. I do know that there are multiple teams that would give him the chance, and that if he were in any other industry, he’d have the choice to do so. It’s morally indefensible to deny someone life-changing money and instead force him to spend two years of indentured labor that can only negatively affect his future earnings, but in the macro it’s easy to see why it’s the case. The NFL wants its free minor league and to avoid having to take the risks inherent in evaluating teenagers; the NFLPA wants to hold off incoming competition for its members; the NCAA wants its top moneymakers to make them money for as long as possible. It’s a system that serves everyone, except Lawrence. But isn’t he the one we’re all here to see?